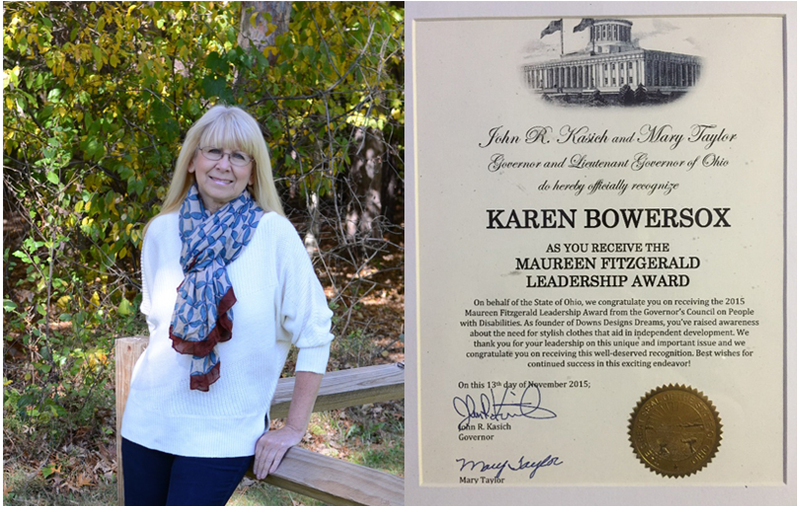 Karen Bowersox is a life-long entrepreneur who is deeply committed to helping others. Karen has served as a panelist on Creative Minds in Medicine and her work has been featured on CNN, CBS, AOL, Huffington Post, ABC TV, Today’s Family, in an interview with supermodel Kathy Ireland, in the Globe and Mail Newspaper (Canada), the Daily Mail (UK), and in press releases put out by The White House and the Veteran’s Administration. In the fall of 2016, Karen was one of a handful of people invited to participate in a disabilities event, Designing For All, hosted at the White House. Karen Also serves as the Executive Director of the nonprofit organization Downs Designs Dreams. Through Dreams’ Adopt-A-Jean Program submissions, Karen actively donates clothing for the disabled individuals and families in need. “Since I began this journey in 2010, I’ve had a vision. Not only do I hope to improve the fashion choices of clothing for the disabled populations throughout the world, but I would love to showcase their abilities while working alongside them. I see a huge warehouse, with men on tow motors, unloading trucks every day. The shipping and receiving department is busy packaging orders for shipment and putting away the latest truckload. The latest orders have just returned from customers utilizing our personal fitting service. I hear the hum of sewing machines down the hall in the alteration room. Our amazing seamstresses are busy hemming and ironing their final orders. I see a team of designers working on next season’s sportswear line. The phones in customer service are ringing off the hook and we just hired a new employee; her name is Janie and she has Down syndrome. Last week we brought in a disabled veteran as a new customer service rep. He is doing a great job communicating with our customers and able to focus on his abilities instead of what he has lost. The accounting department is busy keeping up with all the paperwork and the break room is empty with just a few dirty cups sitting on the table. My calendar is full of speaking engagements bringing awareness to the community. Mary, who has Down syndrome, wears a Downs Designs dress that her mom just bought her and she looks amazing. Bobby is eight years old and is autistic. His mom just bought him new NBZ Boy’s Jeans and he loves how they feel. He thinks he looks cool today and has no problems with his sensory issues. Jimmy has Down syndrome and just got a new job at McDonald’s. He’s so excited about his new position, but when they told him he had to wear black pants every day, he wasn’t worried. He just bought a new pair of Downs Designs pants last month and knew he would look his best on his first day on the job. Children with disabilities in schools everywhere are sitting quietly in their seats when the bell rings. They’re off to the bathroom where they proudly can pull their own pants down and no longer need help from their aid. Yes, that’s where I see our future and one day, my dream will surely come true!